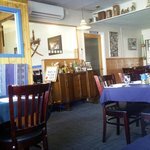 Love this cozy little quaint Greek restaurant. Food is great, nice atmosphere, good service. They no longer open fur lunch which is a shame as that was so convenient but their suppers are awesome. 10 Stars - not 5 ! Cute, cosy, clean, little place...best kept secret is right. Best Seafood Fettuccini Ever. My server , Chelann was amazing ! This is the place to dine in Penticton. Easy to find, street parking, good signage. Try it !! Great place! We were invited out by friends and they chose this restaurant that they have been to many times before. All four of us had the same Shoulder roast Lamb. My wife and I split the order and had a salad for an appetizer. The lamb just melted in your mouth. We will definitely return! Always get a good meal at spiros cubby hole. Service is good. I had soup - creammy tomatoe based with chicken and spinach pies with tzatziki and my husband had Pasta. Very good. Had to take some home. Portions good but better be for the price. What a great little hole in the wall!!!! I had the seafood risotto which was absolutely delicious! The environment was homey and welcoming and the staff friendly. Will definitely come again!! Been to Spiro's Cubby Hole? Share your experiences!